The Basil B-Safe Backpack Nordlicht has a capacity of 18 litres and is a striking backpack with several innovations. Bicycle backpack? Yes, but it’s a pannier and backpack in one! The bag has an anti-theft feature, thanks to a hidden zipper and several hidden pockets. With this in mind, you can take your belongings along with you with confidence! The bag offers space for a 15.6-inch laptop and iPad. There’s also space for an e-bike charger and various small accessories. 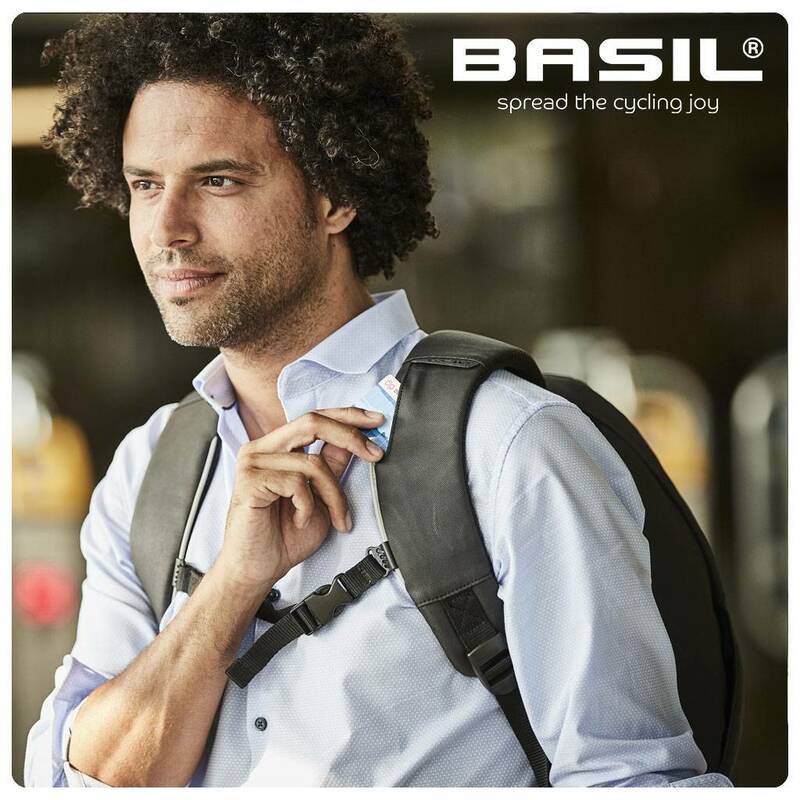 There is a hidden pocket on a shoulder strap for your essential cards and small documents, and you can charge your smartphone while you’re on the move, using the USB port. 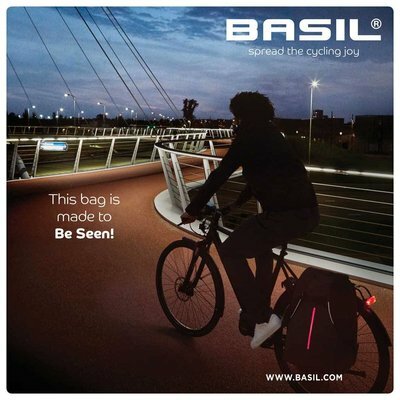 Another smart function is the Nordlicht Technology* LED lighting on the front of the bag. This is not intended to replace your regular lighting, but to add extra visibility. The Basil B-Safe Backpack has padded shoulder straps and fully padded back, so you can carry the backpack comfortably. 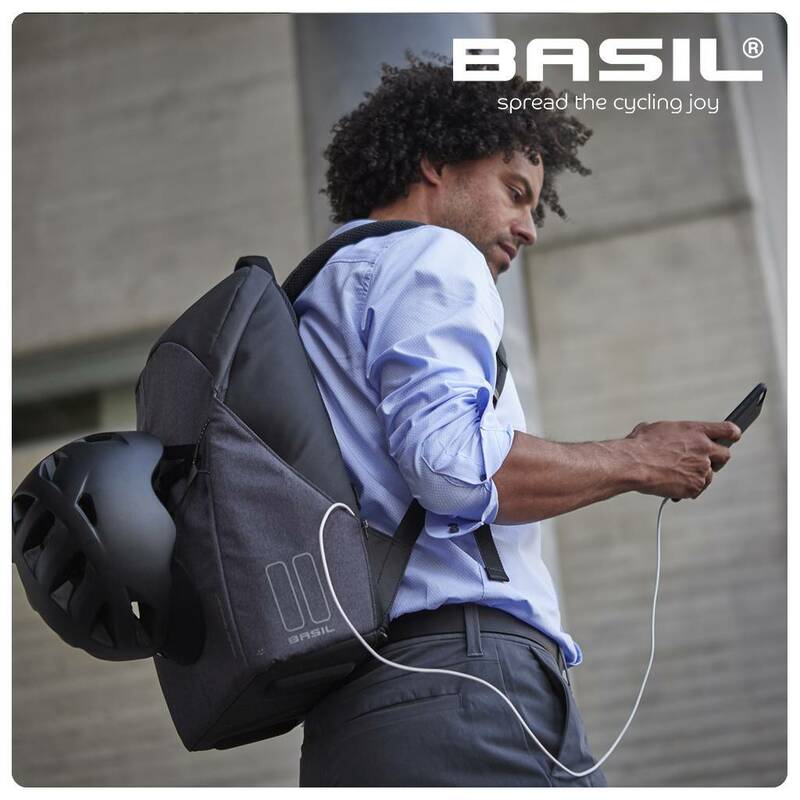 The chest strap keeps the shoulder straps together, even while cycling. You simply hook the bag to the carrier of your bicycle or e-bike using the Hook-On system. What’s more, because the weight of the bag is taken by the carrier, your bike ride will be stable and safer, making it a handy addition for morning commutes in busy traffic. Includes waterproof rain cover to protect your belongings. Features reflective loops to which you can attach LED lights or a helmet. Trolley strap, so you can carry the backpack on a suitcase. * Nordlicht Technology can be used as additional lightning and should under no circumstances replace the legally required bicycle light. Whenever any light is used on a bicycle, it must at all times comply with local regulations.